Cau Dat (Cầu Đất) tea hill is one of the best free destinations for tourists in Da Lat. 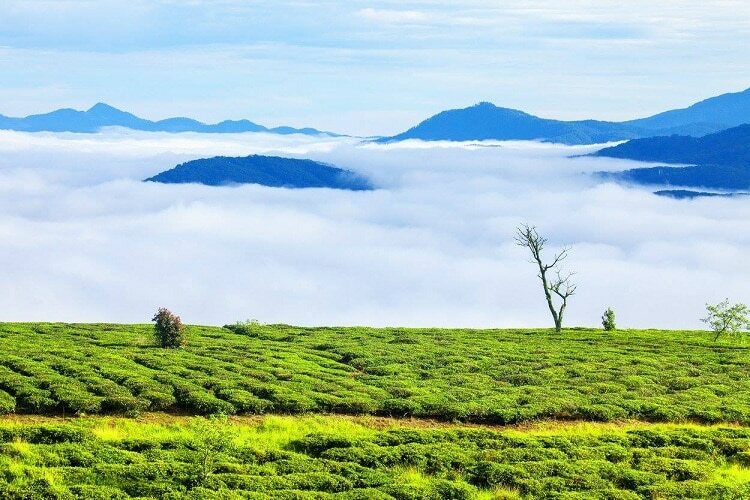 Cau Dat Farm, with an immense landscape of tea hill, clouds in the early morning, mountains, hills, and green pine forests, is a great place for couples to take wedding photos, as well as the perfect place for the youths to selfie and check-in on Facebook. 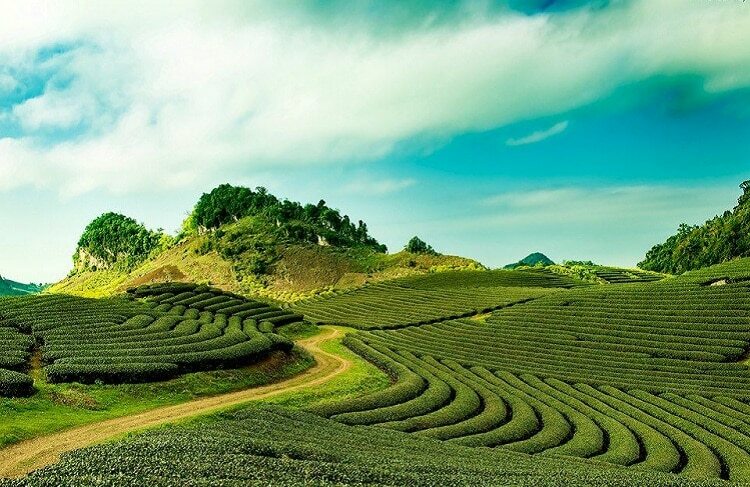 In this article, Vina.com will describe the beauty of Cau Dat tea hill in Da Lat, Vietnam. Enjoy a peaceful feeling when coming to this wonderful destination. Cau Dat tea hill, another name of Cau Dat Farm tea business in Da Lat, is located in Cau Dat village, Xuan Truong (Xuân Trường) commune, about 20km the southeast of the center city. It is an ideal suggestion for tourists travelling to Da Lat. Cau Dat tea hill in Da Lat welcomes everyone all year around for free, so you do not need to call or book before coming. Roads in the tea hill area have been concreted, allowing 45-seat cars to enter easily. However, as far as we know, visitors should park 45-seat cars outside and walk on their own because it is difficult to turn the car inside, as well as can cause a traffic jam if there is another passenger car going in the opposite direction. Passenger cars with 29 seats or less can enter directly inside. 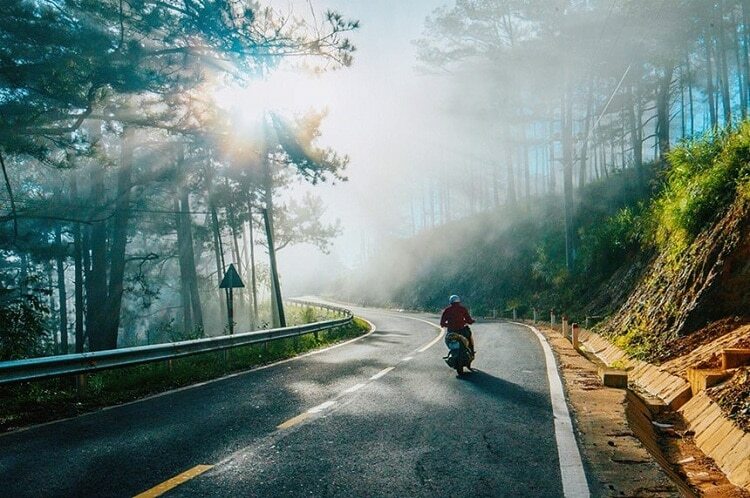 There are 3 ideal ways to go from Da Lat to Cau Dat tea hill, with 3 criteria: convenient, safe, and saving. You should rent a motorbike for about 80,000 VND / day (try to choose new ones). A motorbike can carry two people and it is very convenient to stop, eat or catch a beautiful moment to take photos along the way. This is both convenient and economical. If you just want to visit the tea hill, you can rent a 7-seater car for about 500,000VND, including gasoline, driver and visit ticket costs… More importantly, the drivers are often proficient in terrain and can provide full information about the place like a professional guide. You should spend an additional VND 300,000 to VND 400,000 for this trip to go to other destinations throughout the day. If you just want to visit the tea hill and then come back to the hotel, so you can choose taxi. However, for any other destinations, taxi drivers will require visitors to pay more. The last months of the year are the most beautiful time of the tea hill because at this time, the weather in Da Lat will be cold, cloudy and foggy, making the landscape more magical. The appropriate time to visit and take photos here is the early morning or late afternoon because, at this time, the sunlight is tilt, creating beautiful scenery. On the way from Da Lat to the tea hill, there are only small restaurants and water shops on the sidewalk on both sides of the road. If you feel hungry and thirsty, you can stop at any grocery shop to buy a snack or a drink. If you want to eat more delicious dishes and relax, it is the best way to go to the center of Da Lat city. In Cau Dat tea hill area, there are some roads with shady trees, so you can take a seat, relax, and even organize a small party with fast food there. As mentioned in the first section of the article, Cau Dat tea hill is the paradise for taking wedding photos. 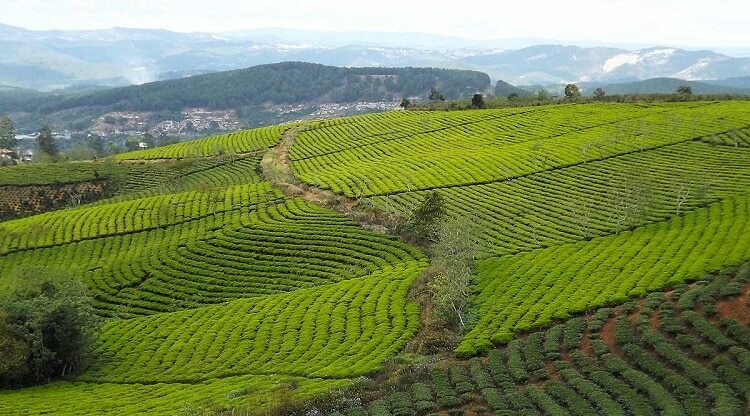 Not only in the tea hill area, the scenery on the way to this destination will also attract visitors with flowers, vegetable gardens, roadside wooden houses, and the roads winding around the pine hill. When coming to Cau Dat tea hill in Da Lat, visitors will have the opportunity to watch the village women picking tea quickly, the fragrant white petals, and small tea fruits like balls under the perennial tea plants. In the distance, visitors will be able to see the quiet, peaceful water surface of Phat Chi lake, helping to dispel worries and chaos in daily life. 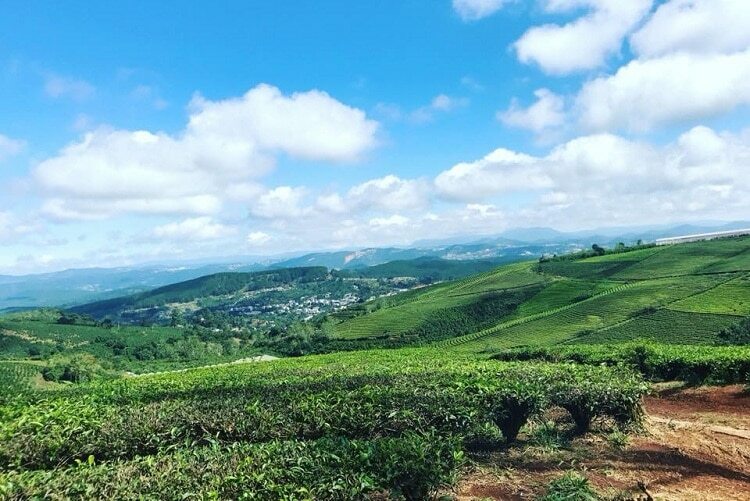 Visiting Cau Dat tea hill in the last months of the year, you will enjoy the beautiful and clear blue weather, as well as watch the wild flowers blooming around the picturesque hill entrance. 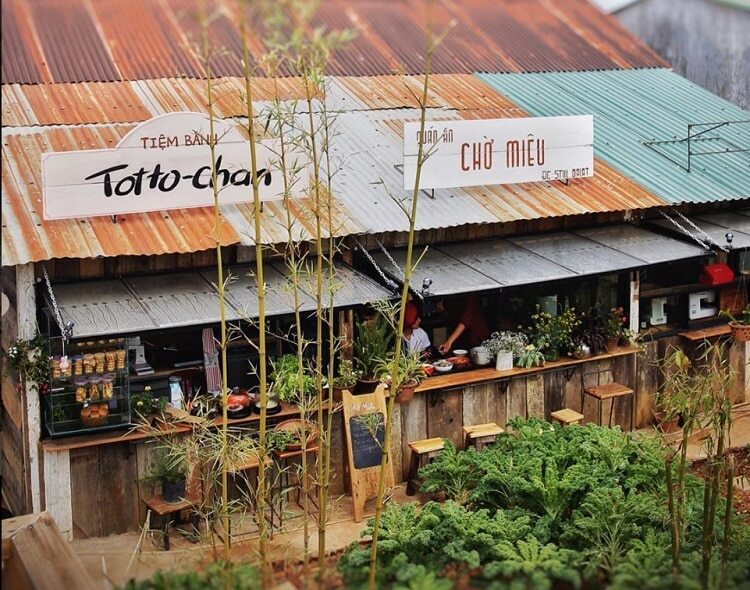 The Container Cafe in Cau Dat tea hill has just opened to allow tourists to see the immense panorama of the tea hill. Discover the tea factory with many complex processing stages and modern machines for free. In hot and sunny days, do not visit Cau Dat tea hill in the noon because it is inconvenient to avoid the sun. You should not visit this place on rainy days as well because the roads are very dirty, muddy, and slippery. On the way to the tea hill, visitors will have to go through a small pass with many folds and slippery roads in the rainy season. Therefore, drivers should pay attention to driving slowly and carefully. There are many houses around the road, so be careful with dogs, cats, and even children who cross the street suddenly. Over time, Cau Dat tea hill becomes one of the most attractive destinations of Da Lat city for tourists, contributing to draw the full picture of Da Lat. To temporarily forget about hard and busy life in big, crowded cities, you should take a trip to this peaceful destination once and enjoy. Finally, if you have any personal experience in Cau Dat tea hill, feel free to share them with other readers by leaving your comments below.